By Josh Davies, Vancouver, B.C. 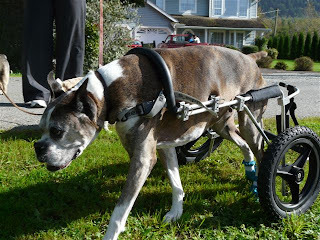 I am the owner of a 10-year-old boxer named Wrangler who has Degenerative Myelopathy. 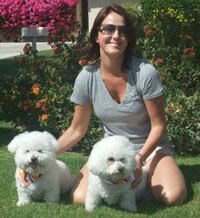 Finding information on Degenerative Myelopathy can be difficult. It’s surprising how little information there is and even how little some vets seem to know. In Wrangler’s case I actually figured out he had DM by talking to other people and searching online. I found lots of touching websites where pet owners have built tributes to their pets who have struggled with DM, however, I have yet to find a one stop place for all things DM. Things like pet stories, product reviews, vet stories, approved kennels, and advice and tips among other things. I hope to be able to tell Wrangler’s story while talking about all the little day to day things you may encounter while caring for a pet with DM. 1) Provide first hand experience with caring for a pet with DM. 2) Review products that can help with caring for your pet. 4) Guest bloggers by people with pets that have DM. 6) Non Profit -- A long term goal is to raise enough money to buy an Eddie’s Wheels cart and donate it to someone who can’t afford to buy a cart on their own. 7) Organize a dog cart walk to raise awareness about DM. Visit MyDogHasDM or contact Josh via e-mail. Very informative tips for newbies. Keep posting! Thanks for posting! I had a Boxer with DM and it was hard to find information other than Dr. Clemens stuff. I am in the process of posting Mulder's DM story. I have a 10 year old boxer with DM also and we are in the process for looking for a cart for him..we have been using a rear harness to help him walk but that is just getting to hard anymore:( it just breaks my heart to watch this disease. i have a 10 year old rotty with Dm. i was told she wouldnt be able to walk or get around by dec of 2012. Its now march of 13 and she is better than ever. She can get up off of slick floors and everything.what did i do to help her condition? Vet tried everything and recomended acupuncture. My mother said she takes yucca stalk for her painful joints and nerve conditions and it seems to help.so i started giving my rotty a adult size dossage about six capsules a day and the vet was jaw dropped when i brought her in six months later. All symtoms were gone.she can reset her rear paws and everything. My vet is now recomending it to clients now. Hope this helps some one. i talk to people who have lost pets to dm and its so sad when they all say I wish I had talked to you sooner. So Im gonna start posting my story online to help other dog owners. Concerned About Your Dog’s Carbon Pawprint?